Attendees are offered an on-water experience aboard a variety of Sea-Doo PWC, the only watercraft with a brake and Sea-Doo 210 platform boats. The Sea-Doo Life Test Ride Tour, a 28-stop national tour, will be in Fort Worth this weekend. The Sea-Doo Life Test Ride Tour offers consumers the chance to experience the boating lifestyle and latest technologically advanced Sea-Doo watercraft and boats for free. These festive events are intended to provide both current and potential boaters a structured opportunity to experience the new Sea-Doo watercraft and boat designs and iControl technology first hand. Attendees are offered an on-water experience aboard a variety of Sea-Doo PWC, the only watercraft with a brake and Sea-Doo 210 platform boats. Each Sea-Doo iControl Tour STOP is designed for both experienced and first time boating families to experience the Sea-Doo LIFE in a casual, fun filled atmosphere with fun to be had on land as well as on-water. When: The Sea-Doo LIFE Test Ride Tour will be in Fort Worth, June 8-10, 2012. Where: Eagle Mountain Lake, Lauderdale's Floating Restaurant, 6500 Wells Burnett Rd., Fort Worth, TX, 76135. Consumers can find detailed event information and pre-register for specific events at http://www.seadoodemo.com for a custom time block on the day of their choice. Details: Visit http://www.seadoodemo.com or http://www.facebook.com/seadoo for the most up-to-date information regarding the Sea-Doo LIFE Test Ride Tour events and everything Sea-Doo! 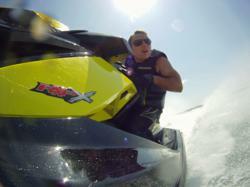 For a look at the new Sea-Doo watercraft and boats, visit http://www.sea-doo.com.